Notice: RiffWorks T4 free download is temporarily unavailable. Buy RiffWorks Standard now, without waiting for RiffWorks T4, and request a refund within 30 days if it's not for you. RiffWorld.com, RiffCaster song posting, and RiffLink online collaboration have been disabled. See RiffWorld forum for details. Capture ideas and create songs easily with a riff-based workflow, loop recording, automatic track creation (4 tracks), 7 guitar-oriented effects, support for amp models (AmpliTube, PodFarm, StudioDevil and others), 1 InstantDrummer (expandable), and more. Stay in the creative flow with tools that look like gear, and create complete songs without putting down your guitar! Upgrade to RiffWorks Standard for 24 layers, REX, ReWire, 9 InstantDrummers and more. RiffWorks T4 download has not been added to the new website yet, but will be added again soon. Email support@sonomawireworks.com if you'd like to be informed when RiffWorks T4 becomes available again. Buy RiffWorks Standard now, without waiting for RiffWorks T4, and request a refund within 30 days if it's not for you. Riff-Based Workflow Record songs in bite-sized pieces (Riffs). This unique and fun way to record facilitates experimentation with song structure. Each Riff can include different backups, effects, tempos, lengths, and layers. InstantDrummer: Tempo-synchronized backup drum recordings with adjustable intensity, variation and tempo. No need for tedious drum programming. 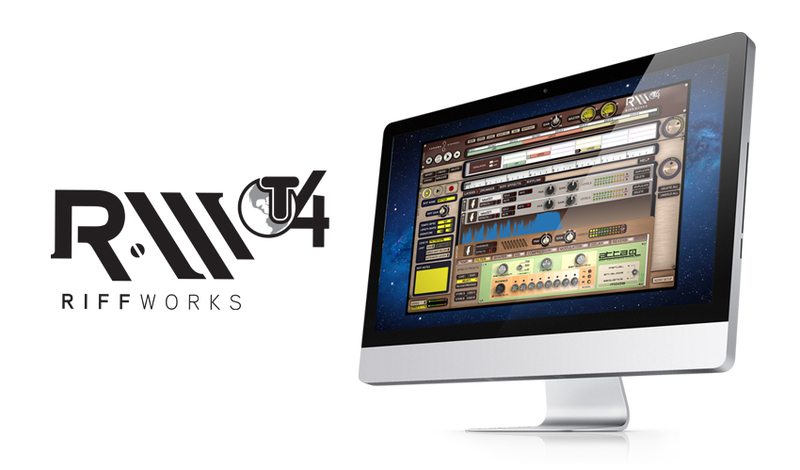 1 Demo InstantDrummer comes with RiffWorks T4 (T4 is temporarily unavailable). 9 InstantDrummer sessions by top drum content companies (worth $4.99 each) are included with RiffWorks Standard. Find more than 100 InstantDrummer sessions to use with RiffWorks T4 and RiffWorks Standard. Add REX & ReWire: Buy RiffWorks Standard to add the ability to record along with tempo synchronized backup loop files (REX and RX2), and to use RiffWorks simultaneously with programs like Reason, Ableton Live and more. 7 Effects: Wah, Multi-band Compression & Distortion, Modulation, Delay, Reverb, Compression, and British Style EQ. These effects can be added to Layers, Riffs, InstantDrummer sessions, and Input. Compatible VST Plug-ins can be activated, heard, and recorded while playing your instrument through RiffWorks. Song Layer:: Record linear tracks, or layers, over a complete song. Useful for recording solos and vocals. Mix Song to .wav: for burning to CD. Mix Song to .ogg for sound player applications. Windows XP ASIO & Mac OS Core Audio Device Compatibility: Supports most devices from Digidesign, IK Multimedia, Line 6, M-Audio, PreSonus and more. See the RiffWorks Recommended Hardware List. Screen Resolution: 1020 (buy RiffWorks Standard to add 1125).